Grevilleas are a long flowering Australian native plant, Standard Grevilleas and Weeping Grevilleas are a great way to incorporate them into many landscape designs. Standardising a plant simply means graft the flowering plant desired onto a strong robust stem, with Grevillea plants this is usually Grevillea robusta. What is grafted onto the top determines if it classed as a weeping or standard type. Once the chosen plant is grafted and has settles in you have a beautiful specimen plant that be grown in the garden or in a container. You will need a sunny position and a well drained soil. It is important to put in a support that holds the stem firmly when planting. Doing this allows the root system to develop without rocking in the wind and creates a stronger upright trunk. The support needs to stay in place through two spring seasons, after this the stem and root system should be strong enough to go it alone. The soil should be dug over well and a little aged compass added. Make sure the drainage is good, if needed hill up the soil to improve the drainage. Plant the standard at the same depth it was in the container. Apply a specialist native plant fertiliser in spring each year. Water occasionally through the first summer during long dry periods. 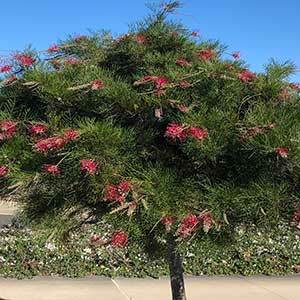 Pruning your Standard or Weeping Grevillea. This does depend a little on the type you are planting and the form you want it take. Weeping varieties such as Grevillea ‘Blue Mountain Rambler’, require less pruning. Those that are the ‘Ball on a Stick’ type such as Grevillea bipinnatifida benefit from regular tip pruning. Some varieties are designed to spread like an umbrella, they form a wide canopy.